On a trip to NE Alberta street yesterday afternoon, I stopped in at Close Knit and Bolt. 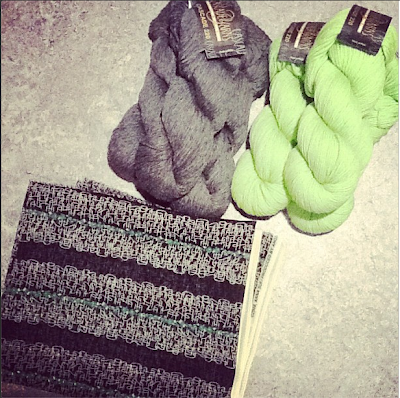 After much searching at the yarn store, I finally decided on this charcoal grey and lime green for the Shellseeker pullover by Heidi Kirrmaier. I popped over to Bolt to browse at fabrics (it's next door to the yarn shop) and found this sheer silk print from Anna Sui. Not sure exactly what I will make, but I loved the print and had to get it. I'm thinking I'll sew up an easy and quick dolman-sleeved tunic.